The Horserace Writers’ and Photographers’ Association was originally known as the Horserace Writers’ and Reporters’ Association, an organisation which was formed after a meeting at the White Hart Hotel in the High Street, Newmarket on April 5, 1927 under the chairmanship of Arthur Coaten of the Morning Post. Although it remained active until the outbreak of the Second World War, the Association was dormant in the post-war years until it was revived in 1967 with the Clive Graham as President and Peter O’Sullevan as vice-president. On its revival, the Association invited the then Lord Derby to be its patron. The current Lord Derby continues in that role. What was still the Horserace Writers’ Association became the HWPA when a resolution was passed at the AGM, which takes place at the Grand National meeting in April, in 1998 to recognise the growing number of photographers in the organisation. The HWPA’s current role is to represent members, which currently number around 450, in negotiations with the Racecourse Association and individual racecourses over accreditation and press room facilities. The HWPA organises one of the most successful annual racing awards lunches – the Derby Awards Lunch – which takes place on the first Monday of December in London and celebrates achievements in the sport as well as the racing media. Previous winners of the Racing Writer of the Year include Alastair Down, Alan Lee, Chris McGrath, Jonathan Powell and Brough Scott. The other media awards include Photographer of the Year, Picture of the Year, Reporter of the Year and, from 2004 when the first winner was Clare Balding, Broadcaster of the Year, an award which bears the name of the late Sir Peter O’Sullevan. 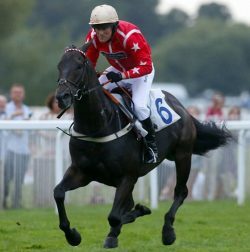 Other annual events also include the HWPA golf day, which takes place at Goodwood on the day before the Glorious Goodwood meeting. On the death of Clive Graham in 1973, George Ennor, who worked for both the Sporting Life and Racing Post, became president and held the position until 1994. His contribution to the HWPA is remembered with a trophy presented at the annual lunch in his honour to an individual who has made a significant contribution to the racing industry. The role of HWPA president has since been held by John Sexton, Geoff Lester, Will Hayler and Steven Cargill who, in 2011, became the first photographer to lead the HWPA. After six years in the role, Cargill stepped down and was succeeded in April 2017 by Marcus Townend, racing correspondent of the Daily Mail.